Malaysia's international trade and industry minister, Mustapa Mohamed, told the forum that in the next decade, Asean would grow by 5% a year. Meanwhile, the EU would grow less than 2% a year, he said. As a result, Asean would overtake it in 10 to 15 years' time. The bloc is being touted as the world's seventh largest economy once it is unified. It had a combined gross domestic product (GDP) of more than $2.4tn (£1.6tn) in 2013, according to consultancy AT Kearney. That compares with 13tn euros (£9.4tn) for the EU in the same period. But with a population of more than 600 million, Mr Mohamed said, the region's youthful population gave it a significant edge over Europe's ageing one. 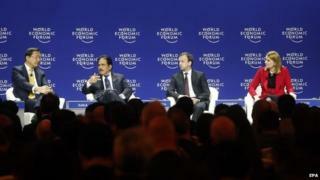 "What we need to do in Asean is to grow much faster, so we get there much faster, we overtake faster," he said. His comparisons to the EU stopped there, as he reiterated that the Asean bloc would not have a single monetary policy or central bank, unlike its European counterpart. The Asean Economic Community (AEC) is expected to be formed by the end of this year, with the aim of creating a single market for the free flow of goods, services, investment and labour. But debate over whether it can be a "true" economic community has been a key topic at this year's forum, with regional country and business leaders weighing in. Malaysian budget airline AirAsia's chief executive, Tony Fernandes, told participants at the WEF that by the end of 2015, integration would not solve all of the region's issues, but it would have created a platform. "It will simplify business, it will raise standards and it will bring prosperity," he said. "If there is a true economic community, everyone benefits." But not everyone was optimistic that the benefits would be spread as evenly. Soon Ghee Chua, managing partner for South East Asia at AT Kearney, said the wide disparity among some of the countries in the group would challenge integration plans. "You have some of the richest and some of the poorest countries in the world in Asean," he said, with wealthy Singapore alongside Cambodia and Laos. "The challenges will be around getting the smaller companies and citizens of Asean excited about it and educated on what are the opportunities that are available." Most people were not very familiar with what Asean integration was all about, he added, saying the education process needed to happen soon. For more, watch Talking Business with Linda Yueh this Friday. Details of when to watch are at bbc.co.uk/talkingbusiness.